A detailed history of attacks on climate science, climate scientists and the IPCC from 1990 to the fifth assessment report. The Greenpeace report tells the story of how the fossil fuel industry has waged a campaign of climate denial for more than two decades through a strategy of undermining public confidence in climate science in order to prevent government action on climate change. In the early 1990’s, as governments began negotiating a global agreement to tackle climate change, a number of lobby groups were set up to prevent it. The denial machine today is run by a network of free market think thanks, largely based in the US, but with outposts around the globe. When the IPCC released its Second Assessment Report (SAR) in 1995, it was met with attacks on key scientists. In early 1998, a small group at the American Petroleum Institute drew up a communications plan to challenge climate science to generate media on the “uncertainty” argument. Following the Third Assessment Report released in 2001, the industry’s strategy was to assert that climate deniers can maintain the appearance of an unsettled ‘debate’ on climate science by repeatedly referencing the ‘considerable uncertainties’ involved in this ‘complex’ area of study. In 2009 hacked emails from the University of East Anglia’s Climatic Research Unit (CRU) surfaced and the denial machine repeated and publicized a succession of non-stories dug up in the stolen emails. Despite a comprehensive trouncing of their claims, the deniers tried a second round, calling it “Climategate 2.0”, released just ahead of the Durban climate talks. This time, the scientists were ready and rallied to defend their work. The climate denial industry has expanded out of its hub in the United States into the international arena over the past 20 years. It remains a largely English-speaking network, centered around the US, but has also spread further into key countries targeted by the deniers and think tanks. It is important to distinguish clearly between those scientists who have challenged the theories of global warming in good faith and the efforts of the denier campaign to undermine the credibility of the scientific establishment. The denier campaign has consistently sought to present its publications and claims in the style of genuine science, tactics modeled after Big Tobacco. 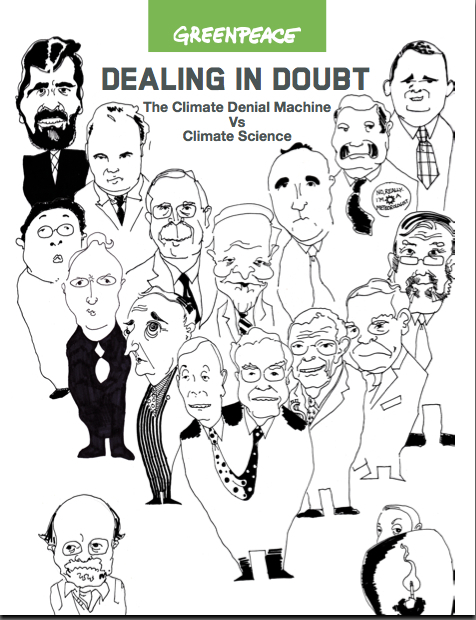 This climate denial effort is aimed at delaying action. Uncertainty and “doubt”, especially in the media and minds of non-expert policymakers, is the objective.